Boca Grande resident Libby Frazier is spearheading a campaign to “Build an Ark” to help a community of people who are lacking the basic necessities to sustain healthy lives. For the past few years, she had been receiving pamphlets in the mail from Heifer International, an organization that brings help and hope to millions of impoverished families worldwide. 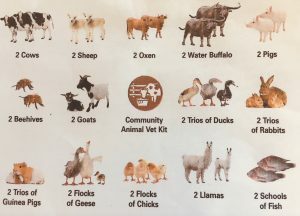 The Heifer Ark package includes two cows, two sheep, two oxen, two water buffalo, two pigs, two goats, two trios of ducks, two trios of rabbits, two trios of guinea pigs, two flocks of geese, two flocks of chicks, two llamas, two schools of fish, two beehives and a community animal vet kit. Since 1944, the organization has worked to provide livestock and agriculture by developing programs that alleviate hunger and poverty. Heifer gifts for the holidays are so much more than just one single contribution. The “Be an Ark Angel” fundraiser project offers a poor and hungry community the opportunity to have a sustainable food source, and pass on the gift by sharing the animal’s offspring to other families. The gift of livestock can eventually provide enough for an entire community, and even further, the animals can be shared to help neighboring communities. Just one llama can produce enough wool to make blankets, ponchos, carpet and rope. And its milk is lower in fat and salt than cow or goat milk. Imagine what an entire ark of animals could do to end hunger and poverty. Dan West, a farmer from the Midwest whose mission was to provide relief utilizing the “teach a man to fish” philosophy, founded Heifer International. And now, 70 years later, the mission to end world hunger is still a continuous battle. The Ark costs $5,000, which is why Frazier chose to lead the fundraiser and share the information with friends who were also interested in making a donation. So far, more than $1,500 dollars toward the cause has been raised. And now Frazier is asking the Boca Grande community if they’d like to help build the ark by making a contribution toward the cause. ATTN: Tiffany Terry – Boca Grande Ark. There is a sliding scale for the donation amount. Under “What Motivated Your Gift Today” please note Boca Grande Ark. Newer PostAre you ready for ‘Taste’? Make sure you get your tickets soon!